Bactericides have been available to growers as a new tool to improve the health of HLB-infected trees since early March 2016. This use has been under a crisis declaration from the Florida commissioner of agriculture, but on August 15 of this year, formulations of oxytetracycline and streptomycin became available under a Section 18 emergency use permit. Although these bactericides have been in use for nearly six months, growers still have many questions about the best use. Field research supporting the advancement of these bactericides has shown some improvement in tree health, a reduction in HLB-related fruit drop and a reduction in the bacterial concentration in the tree following season-long use. This, however, is dependent on several factors, including the level of decline of the tree when applications began. In an effort to gain a better understanding of what growers are doing with approved bactericides this season and to share this information with growers while we all wait for evidence of impact to appear later in the season, the Citrus Research and Development Foundation (CRDF) partnered with AgNet Media to conduct a short survey which would characterize the patterns of use of the bactericides. The survey includes bactericides applied so far this season, as well as season-long treatment plans. One hundred growers responded to eight questions that captured grove situations and use of bactericides. The acreage managed by these growers is 202,379 acres of oranges, 29,525 acres of grapefruit and 8,401 acres of specialty fruit. This represents nearly fifty percent of Florida’s citrus acreage. A large percentage of the growers who responded to the survey manage less than 500 acres of citrus, and these growers represented 3 percent of the reported acreage in this survey. 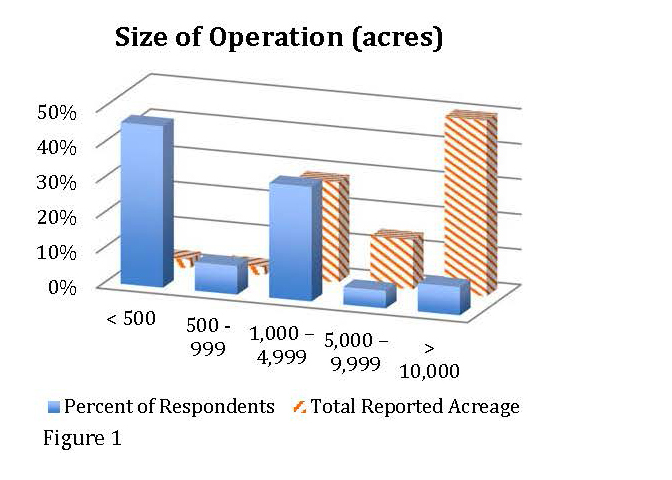 A much smaller percentage of growers who responded each manage more than 10,000 acres, and represent 53 percent of the total reported acreage (see Figure 1). The 240,305 acres represented in these survey results were spread across Florida’s major production regions. 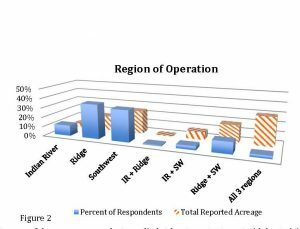 The greatest number of responses came from those managing groves in the Ridge and Southwest citrus-growing regions, although the greatest acreage represented was from respondents managing groves in all three regions (see Figure 2). This was expected, since eight growers managing more than 10,000 acres represent 53 percent of the total acreage in this survey. All but seven of the survey respondents applied at least one treatment with bactericides since March. Of those that have not applied bactericides, only one does not plan to apply them. 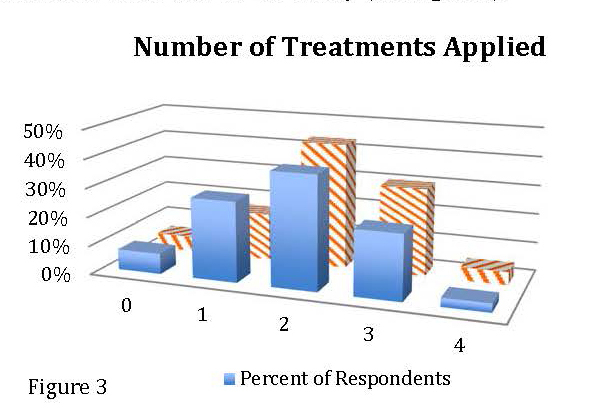 An average of approximately two applications were made at the time of this survey (see Figure 3). Respondents reported that they intend to apply between zero and 11 applications this season. The majority of respondents planned for two to six applications (see Figure 4). When asked what percent of their acreage they intend to treat during this season, the response was a weighted average of 84 percent, or approximately 201,724 acres. Two-thirds indicated that they would treat all of their acreage with these bactericides. Two-thirds of those who completed the survey indicated that they were rotating the two active ingredients, streptomycin and oxytetracycline, while some respondents reported using one or the other active ingredient exclusively (see Figure 5). The growers rotating materials represent 219,889 of the 240,305 acres in this survey. Rotating active ingredients is an important mechanism for resistance management. Most growers in this survey are applying the bactericides both during the day and night (see Figure 7) and as a tank mix with other materials (see Figure 6). 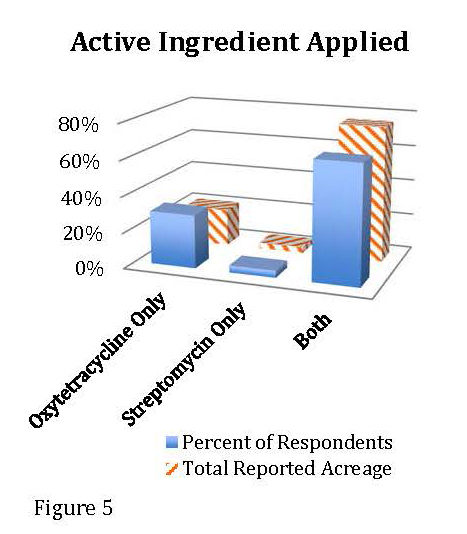 Some respondents applied the bactericides alone to minimize interference with other chemistries. Some of the respondents are focusing on the spring and fall flush periods, and others intend to prioritize younger over older trees for bactericide applications. 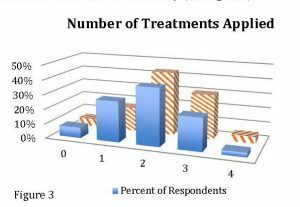 Comments offered by respondents indicated that, because there is no standardized treatment regime, grove-level experimentation is occurring by leaving rows or whole blocks as untreated controls. These small field trials are important and will contribute to the development of standardized treatment regimes. CRDF is working with growers to evaluate individual bactericide treatments using a standardized protocol; the data collected from these trials will be analyzed and the results will be provided to growers. The purpose of this analysis is to identify the most effective treatment regimes for subsequent seasons. Stephanie Slinski is the CRDF bactericides project manager and Harold Browning is CRDF chief operations officer.